A few weeks ago I had big plans about posting an entire week of posts devoted to Earth Day - filled with eco-friendly projects for the whole family. But, yeah, that just didn't happen! Instead, I only found the time for one project, but I think you'll like it! But I think you'll find this project affordable and fun! Since we're trying to emulate paper towels here so they'll sit on a proper paper towel dispenser, measure your fabric (15 1/2 inches x 12 1/2 inches) - you'll be using a 1/2 inch seam allowance when you sew. and cut 6 in your terrycloth. 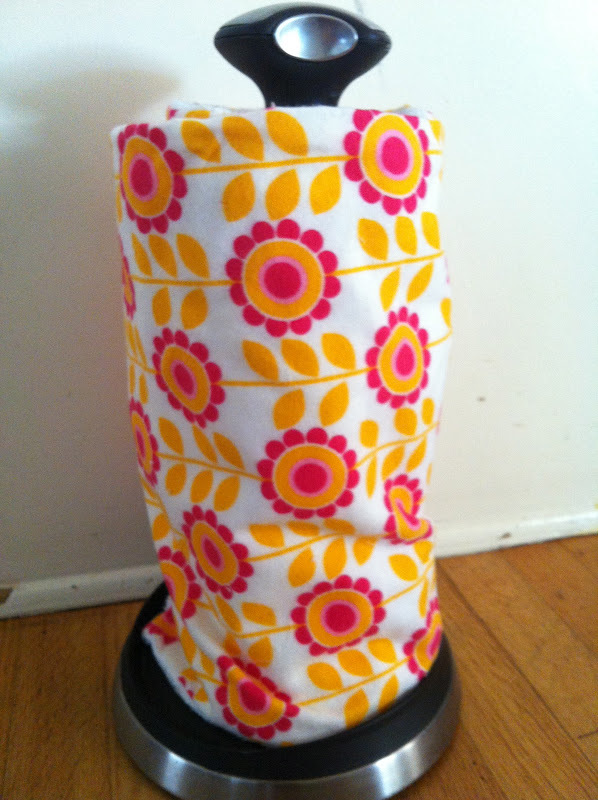 With right sides facing, pin the terrycloth to your printed pattern. Terrycloth is not the easiest fabric to work with. It shifts and moves as you sew. I prefer to have the printed side facing me as I sew since I know that it's more immobile and acts as a better shape guide while sewing. Sew together all the way around the square leaving a 3 inch opening for turning. and cut em! You can cut the corners at an angle and if you have a lot of extra fabric along the sides, you can cut that as well. This will cut down on the bulk of the cloth towel. Find that three-inch gap you left open. 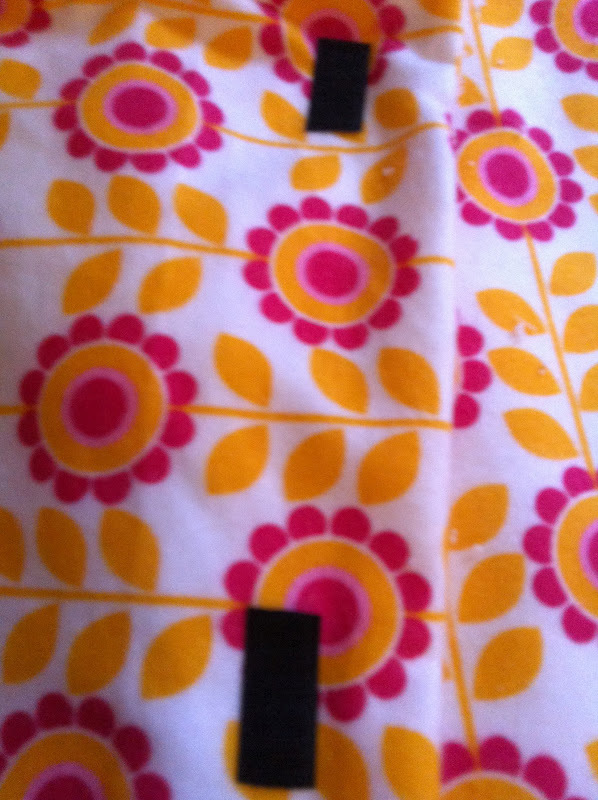 Press both seams inwards and sew. Repeat this process 6 times. Now you have 6 pretty cloths! But you need them to be able to be connected to one another like real paper towels. Grab your Velcro. 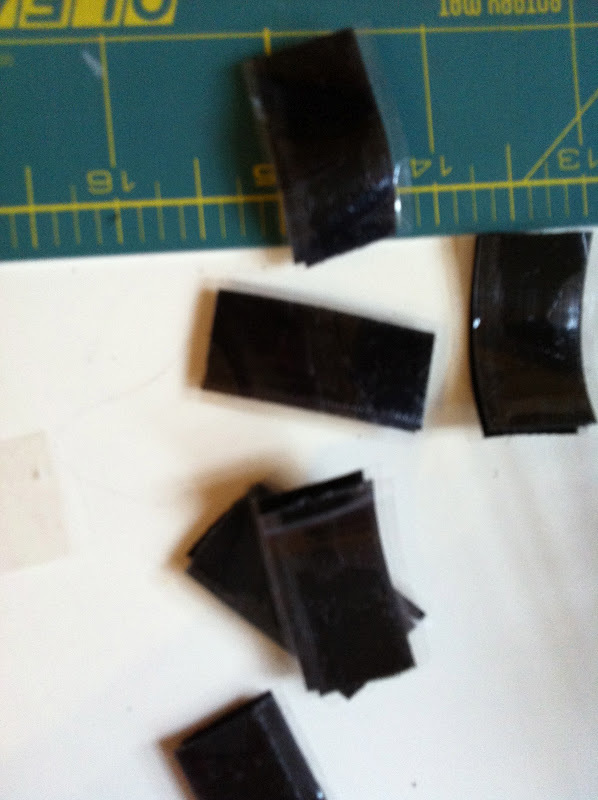 Cut them into 1 1/2 x 1/2 inch rectangles. 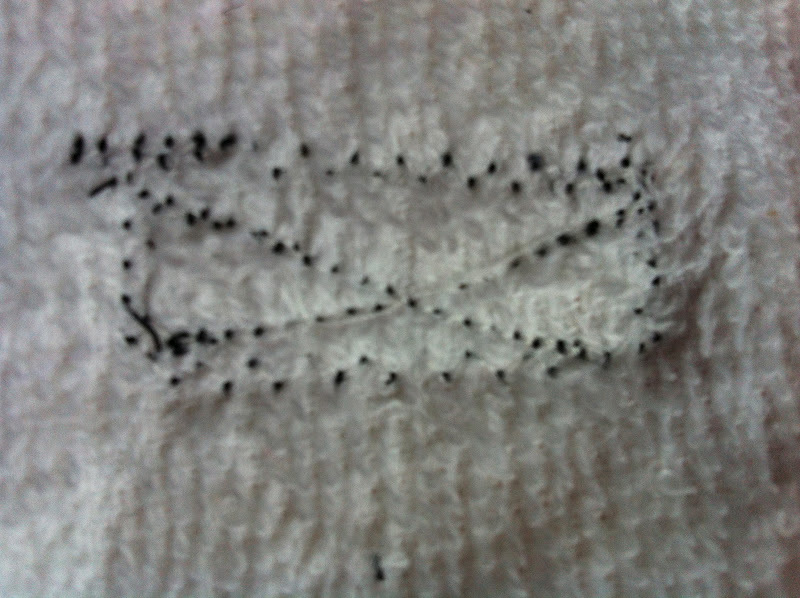 On the printed side, place the soft Velcro in the same two spots on each cloth. 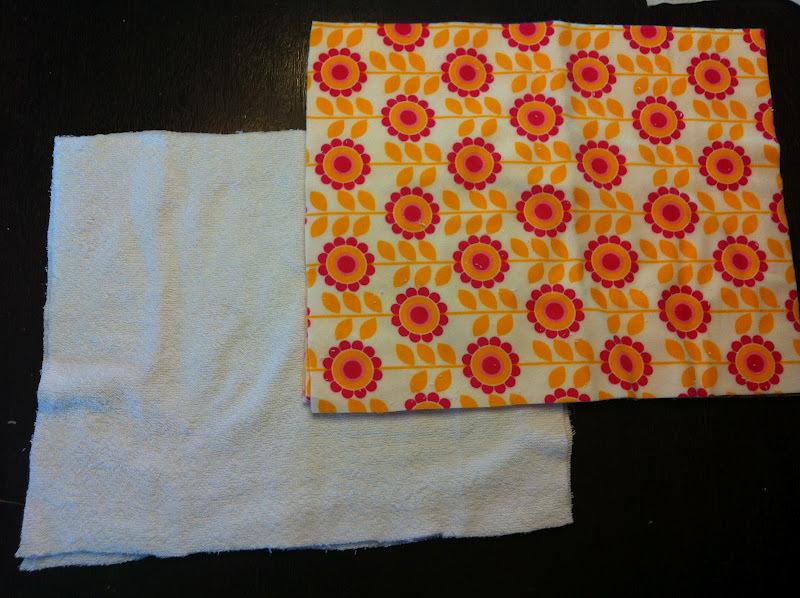 Since I use the adhesive Velcro, I like to place both entities of Velcro on my material, then take terrycloth of another cloth towel, lower it onto the patterned side of a cloth towel and press til it sticks. Then I can unVelcro the whole thing and everything is perfectly lined up. 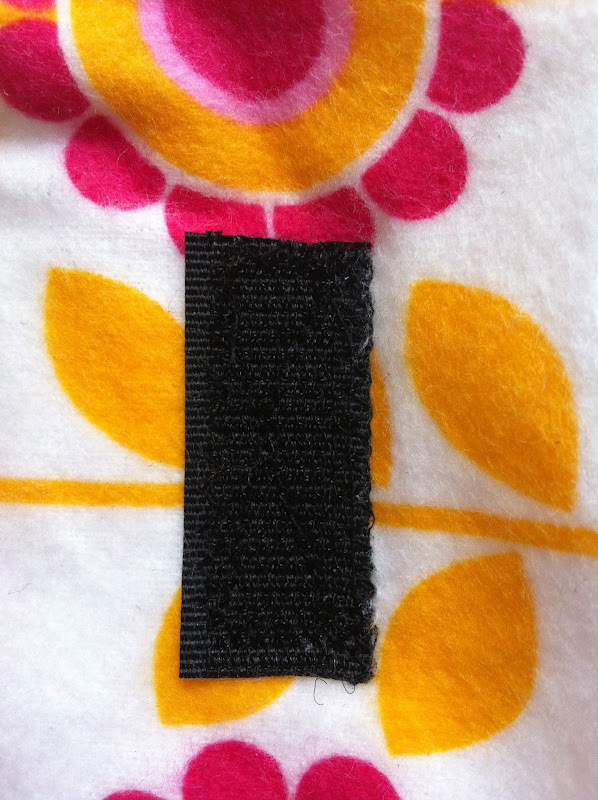 The one thing you have to remember is be consistent in what side of the Velcro you are using where. 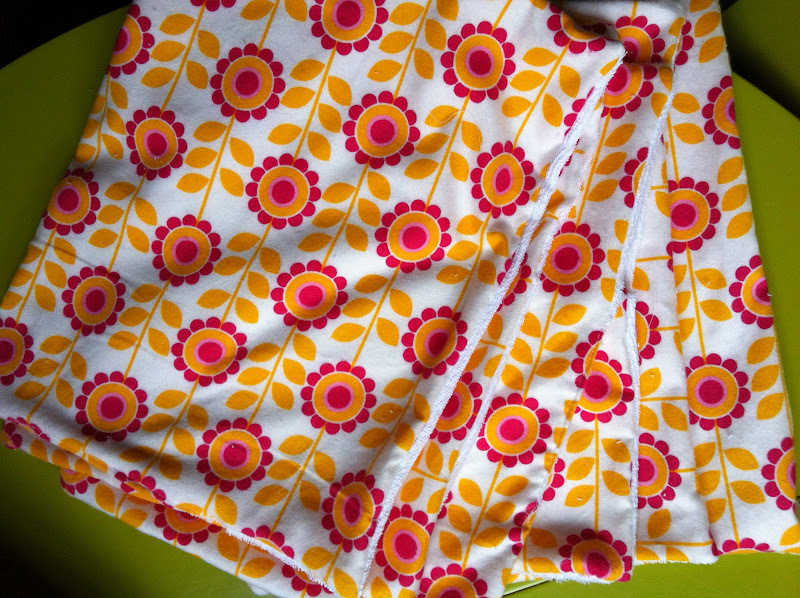 If you're using the soft side on the patterned cloth...stay soft side for all patterned cloth and then the rough side for all terrycloth material. Sew all Velcro squares into place. I like to go around the circumference of the Velcro square, and then sew an X through the middle. 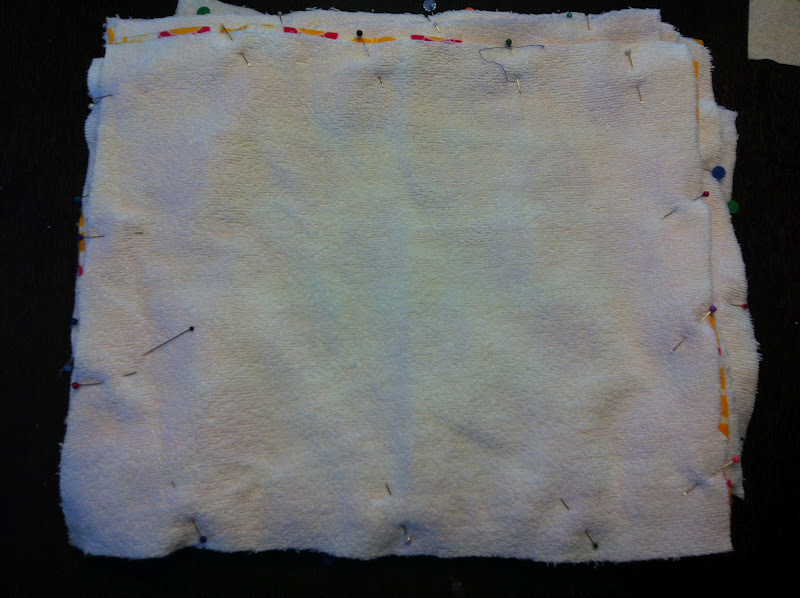 You can't really see my perimeter sewing and X shape in the photo above, so here's the view from the terrycloth side. 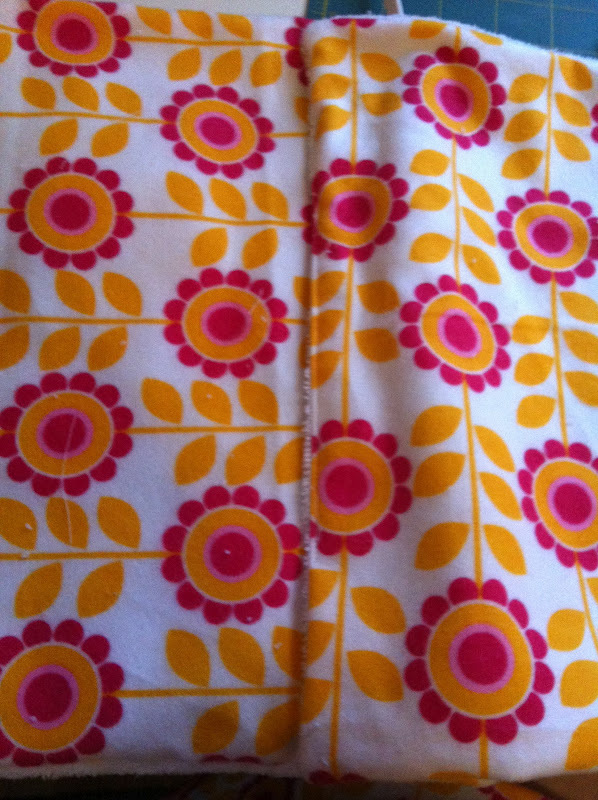 When I sewed this, I used black thread for the top and white thread for the bottom. Line up all towels and stick to one another. 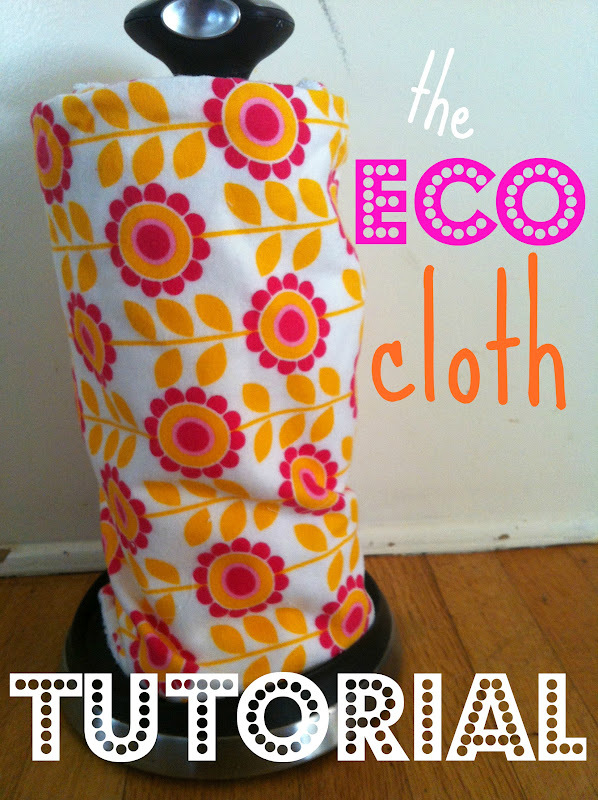 Carefully roll onto the nearest paper towel holder and say adios to paper waste! LOVE it! I have seen this before, but they didn't show how to make it (maybe I saw it in an etsy shop or something). I totally wanted to make them but didn't know how. Thanks for the help! I'm pinning this for future reference. I've seen these around and been wanting to make one for ages! Thanks for the inspiration - I'll get to mine soon!! I've never heard of this, but this seems like a great idea. Thanks for sharing the tutorial! Great tutorial, I've made some of these for gifts and used snaps to hold them together, I never thought about velcro because I hate the stuff, but I'll bet it works better when you're trying to get them apart quickly!! What an awesome idea. I'll be honest, I'm lazy, and we just keep a stack of rags out in the garage. It's handy to the kitchen, but it doesn't look nearly as nice as yours. What a great idea! I would Love to have you share this at my link party going on! Great idea!! Stopping by from Rhinestone Beagle linky party. 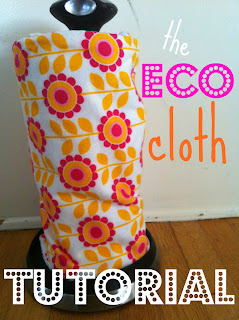 What a great idea and a great tutorial!! Thank you for sharing at Sharing Saturday! I hope you are having a great week! Just want to let you know that I will be featuring this week at Sharing Saturday! Feel free to stop by Crafty Moms Share and grab a featured button if you would like. I hope you have a wonderful weekend! Wow this is a really cool idea. My kids are horrible with wasting paper towels. Thank you so much for linking up on Dare to Share. I look forward to seeing what you link up next. 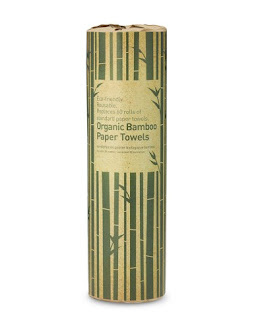 Looks good and saves the environment- what's not to love. I shall have to try this! Thanks for sharing your tutorial! I'm making some for Christmas gifts and this was very helpful. Did you just use regular cotton or did you use a flannel for your printed side? 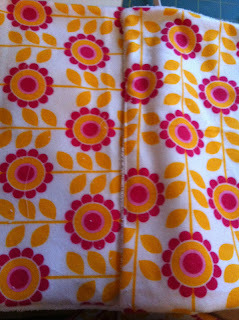 Hi Jessi~ For this one I used a flannel but regular cotton will work as well. It depends on how textured you want it to be! How do you handle the velcro in the washing machine? I can imagine velcro-ing the dirty ones together in a loop, but it seems like they wouldn't get clean that way . . . I would love to hear how exactly you wash them! Hi Anonymouse. In answer to your question, I handled the velcro delicately. Keep in mind I sewed around the perimeter (square-shape) and then an X through the center, so the velcro is not going anywhere. But I do wash them on a gentle cycle and dry them on a gentle cycle open in the washing machine. I hope that helps answer your question! these are SO pretty and I was wondering how many to make in order to make a nice bundle when I saw on etsy...thanks so much for the details...if anonymous is very worried about the velcro, can also use snaps as alternative, either way is VERY nice alternative to continuously buying paper towels and so much prettier! Again thanks for the tutorial!